Lately it seems that many of my friends are either returning from a pilgrimage to a holy site in Europe or planning one. I long to make a pilgrimage too, but since it’s not in the budget right now, I’ll have to settle for living vicariously. 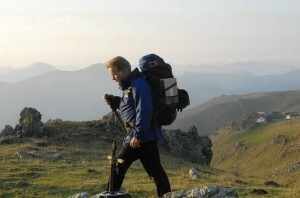 Fortunately, a new movie titled The Way, starring Martin Sheen and his son Emilio Estevez, offers an opportunity to join in the adventure of one of the most popular pilgrimages — El Camino de Santiago (The Way of St. James). The Camino is an arduous 500-mile trek through Spain and France. It ends at Santiago de Compostela and the Cathedral of St. James, where the Apostle is believed to be buried. The Way chronicles the journey of a curmudgeonly ophthalmologist named Tom (Sheen) who travels to France to collect the remains of his estranged son Daniel (Estevez, who also directs the film and wrote the screenplay). Daniel was the victim of a freak snowstorm in the Pyrenees while hiking on the Camino. On a whim, Tom decides to finish the journey that his son began. Along the way, he meets three fellow pilgrims who are facing their own demons. As the foursome traverse the Camino, they learn important lessons on life and community. I had the opportunity to talk to Martin Sheen as he and Emilio travel the US on a bus tour in support of their labor of love. Peggy Bowes: I read that your son Emilio jokingly complained that it was difficult to shoot the film because you stopped to talk to everyone on the Camino. Martin Sheen: [Laughs heartily] I have a great deal of fun when I’m working, and we were shooting this film on location in a very public way. People recognized me, and I was delighted to share a greeting and be present to them, but I must admit that sometimes I got distracted from the shooting schedule so I need to apologize to Emilio for that. Peggy: Who was the most interesting person you met? Martin: There are so many! There was a family from Australia who was suffering the loss of a daughter in an automobile accident. They were making the journey in her name, and they had created a foundation in her honor. She was a young nursing student in Australia. We met up along The Way and we stayed in touch, in fact. They were going through the same kind of grieving process with the loss of their child that my character was suffering in the movie, so we felt a connection. They were overjoyed to find the Camino such a healing experience. A lot of people take the Camino who are going through a grieving process and who are suffering great loss, and they invariably find an equal measure of healing. That family was really the most inspiring group that I met. Peggy: What was your favorite place on The Camino? Martin: My favorite place is Santiago itself. I’ve been there several times, and to bring the film in there was very exciting because we were the first and only film company, I understand, that they ever permitted to film inside the cathedral. They [previously] allowed only newsreel footage and occasional documentary footage. We were the only ones with a scripted story. They were reticent and were not anxious to have us in there. They didn’t quite know us, and they weren’t sure of what our scenario was. It was 48 hours before we entered the city before we got permission. It was an added miracle. If you’ve seen the film, you know the ending is absolutely essential, otherwise we have no film. The last 15 minutes of the film centers mostly inside the cathedral with each individual we’ve come to know and love along the journey and their personal response to the sanctity of that place. It’s so powerful! So that’s still my favorite place. Peggy: I heard that you got even the atheists on the crew to pray for access to the Cathedral at Santiago. Martin: [Laughs again] Yeah, well Emilio did start a novena, kind of. He said he wanted everyone to start praying and lighting candles so that they would open the doors of the cathedral because otherwise we would all be out of job, and we wouldn’t have a film. There were multiple miracles. Peggy: What types of miracles? Martin: The first one started the whole journey for us back in 2003 when I was driving the Camino with my grandson Taylor, who is Emilio’s son. He was 19 and working for me as an assistant on The West Wing at the time. He and I were driving the Camino because we didn’t have enough time to complete the whole 800 km journey. At Burgos we stayed at a refugio run by this family whose daughter Julia was a very beautiful young girl and served us supper that night. She and Taylor fell in love instantly. They got married and they live in Burgos. That was the start of it. Julia’s mother’s name is Milagros [Spanish for “miracles”]. Tell me that’s not significant! That was the very first miracle. It just accumulates from there. Peggy: Was the bus tour to promote The Wayeffective? Martin: We’re on our American pilgrimage now, so to speak, in this bus tour. We’re on our 23rd city in the last 6 weeks. We’re in New York City, and the film opens tomorrow. We’re just so excited about the response we’re had across the country, particularly among young people. You know, young people in America are really not familiar with pilgrimage and we’ve gotten so much interest. I think the tourist board in Spain is going to be surprised with a spike in the number of American students doing the Camino next year. Peggy: As a Rosary devotee, I love that you started the bus tour with a Rosary and the film opens on the feast of Our Lady of the Rosary. I’m very fond of the Rosary. It has great meaning in my life. I’ve become known as “The Rosary Dispenser” because I leave rosaries wherever I go. All the vehicles that everyone in my family drives have a blessed Rosary on the rearview mirror. Our bus has one as well. I wouldn’t leave home without it. I love the Rosary and of course this is the month of the Rosary, October. I’m a devotee but I’m especially pleased with how often the Rosary appears in our film. I play a lapsed Catholic on the Camino and I run into a Catholic priest who’s on pilgrimage and he gives me a Rosary and a blessing in the film. It’s a lovely moment. The Rosary is very significant in our movie. to the TRUTH you learned from the Master’s lips. 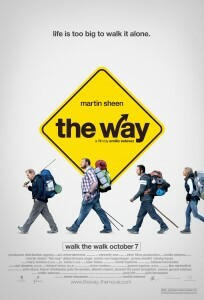 The Way was released in select cities on October 7th and will be in wider release on October 21st. To find a theater near you, visit the website www.theway-themovie.com . The film is rated PG-13 for drug use, smoking and thematic elements.